Something to be mindful of when in the canyon is that the Park Service "turns off" the water in the Colorado River from mid October to mid May and at the same time, the North Rim Lodge will be closed. Shuttles around the South Rim village change on on/off peak times. Stop at the Visitors Center to get all the facts. This is a must do run! You'll be propelled to get to the next mile by the beauty the canyon possess. The unique aspect of crossing the Grand Canyon is that you first descend 9 miles, then run across the floor for 7 miles, before hitting the steepest part of the North Kaibab Trail where you'll climb 7 miles up a 15% - 20% grade. Pacing yourself is the key to finishing R2R2R. The views in the canyon as the sun kisses the walls change with every hour. Take your time to enjoy all that the Grand Canyon has to offer. Make time to visit Ribbon Falls just off the North Kaibab Trail. Take a dip but don't stay too long as you have a long day ahead of you. The falls are about a mile off the trail. Take the bridge exit off of the trail to get there. The trail is about the width of 1/2 a fire road and is very technical with big exposed drop-offs. There are big steps (depending on your height), and the puddles of mule pee are wide spread so watch you step and don't face plant. Watch the weather. During this trek, we were caught in a flash flood and experienced lightning, rock slides, and crossed 7 muddy, fast, rushing (new) streams. Fall and spring are the perfect time for this crossing. The Bright Angel Trail is two miles longer (4 if it's an out and back) than the traditional route of South Kaibab. But having your car a few feet away after running 48 miles and climbing 14K feet is invaluable. You are soaked from sweat or rain, and it's freezing at both Rims. If you are an organized group of 30+, or are a guide (meaning you are getting paid for guiding people across the Grand Canyon), you'll need to obtain a permit. Be EXTRA polite to hikers, don't stash packs or food, yield to mule trains, and BE PREPARED for all the usual hazards including flash flooding. IF you decide to only do one crossing go to the North Rim lodge and try to get a ride with Trans Canyon Shuttle service, be aware that maybe they'll have a seat available, but it will cost about $100 for the 4 hour drive back to South Rim. CARRY cash on you "just in case" you need a mule ride out, shuttle back, or that awesome t-shirt at the North Rim Lodge. Starting with the Bright Angel Trail allows you to park close to the trailhead and not rely on shuttles or parking restrictions. A 4am start allows you to be in the dark a little on the front end of your journey and a little on the back end, which is preferable to running through the night. 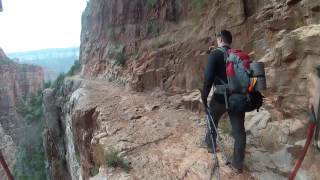 Descend the Bright Angel Trail to the Colorado River, through Bright Angel Campground, and then head up the North Kaibab Trail. Views on the Bright Angel Trail are framed by massive cliffs. The majority of this trails elevation change takes place in the upper four miles of trail via a series of switchbacks that can seem endless. Be sure to utilize the resthouses and seasonal water sources along the way (there are composting toilets at Mile-and-a-Half Resthouse, but no toilets at Three-Mile Resthouse). Approaching Indian Garden, the trail flattens out considerably as it crosses the shaley and desolate Tonto Platform. Indian Garden is an oasis in the canyon that was used by Native Americans up to modern times. Below Indian Garden, the trail follows a creek through a meandering gully of water sculpted stone and shimmering cottonwood trees. The trail becomes steep once again where this gully empties into the broad, bowl-shaped Pipe Creek drainage. This section of trail, affectionately referred to as the Devils Corkscrew, is brutally hot during the summer months and should therefore only be attempted during the early morning or late evening hours. There are no potable water sources between Indian Garden and Bright Angel Campground. A composting toilet is located near the River Resthouse. From the Pipe Creek/River Resthouse area to Bright Angel Campground, the trail traverses exposed sand dunes for over a mile until reaching the silver bridge across the Colorado River. From here head cross the Silver Bridge and start on the North Kaibab Trail. The North Kaibab Trail is the first challenging ascent as you'll climb 7 miles up a 15% - 20% grade. Pacing yourself is the key to finishing R2R2R. Along the North Kaibab trail you have the option to take a short spur trail to Ribbon Falls or Roaring Springs. Now you are at the half way mark! Go back and cross the same way that you came. Keep your eyes out for big horn sheep, as that will be your special gift if you see one. Elk are everywhere on the rim, but remember to admire them from afar. The Grand Canyon is the oldest geological wonder of the world. Looking down on it from the rim is not fully understanding it's amazing beauty - you have to venture below the rim for the full experience. Don’t do this when Phantom Ranch has forecast of 100° temperatures. Thinking a swim in the Colorado River sounds good. Deer graze near Bright Angel Campground.